Perfect for your family vacation, wedding, or reunion! TahoeTarns is located OUTSIDE of the City of South Lake Tahoe. No OUTRAGEOUS $2000 parking fines at TahoeTarns! 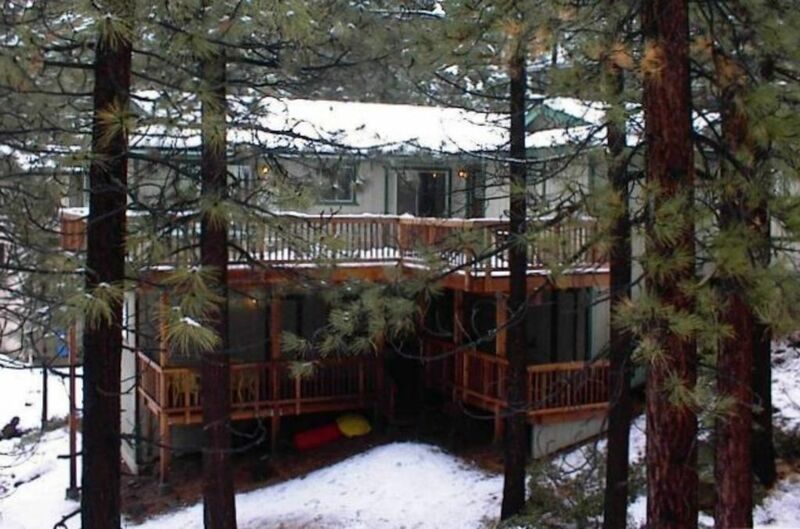 2,400 square feet, 500 square foot deck with built-in hot tub, comfortably accommodates 14 people. Natural gas central heating, 2-Car attached garage w/ street level entry, Additional off-street parking for at least 3 cars, Great sledding right next to the house during the winter! A short walk (2-5 minutes) to the lake and Zephyr Cove Resort (Tahoe's most popular public beach, M.S. Dixie II cruise ship & watercraft rental). Just 4 miles north of South Lake Tahoe gaming casinos (Harrah's, Horizon, Hard Rock, Harvey's), 15 minutes from Heavenly ski area, 1 mile from Wally's Huddle (a favorite for beer and pizza), and 1/2 mile south of Zephyr Cove Park (library, lit tennis courts, picnic areas, and fitness courses). Plenty of National Forest trails in the area for hiking, biking, and cross-country skiing. "Our mission is to provide a wonderful home for your vacation, and to exceed your expectations of value and quality. If we do this, you will enjoy your stay at Lake Tahoe and will come back again. This is important to us, because repeat customers are our best customers." -- Maria & Bob Tarn, renting our vacation home to Tahoe visitors since June, 1994. We are a Pet Free & Smoke Free Home, Please. Douglas County, Nevada Vacation Rental Permits #05-060 and #DP18-0317. Bob is a mechanical engineer and Maria is a paralegal. They enjoy their family gatherings at the lake, and hope that their 3 sons and their growing families will continue to use the house at Zephyr for their family gatherings for many, many years to come. We spent a family vacation at Zephyr Cove, Lake Tahoe, in the summer of 1991, and fell in love with the family-oriented and clean environment. Before we left that week, we were looking at property, and bought this perfect vacation home after a year and a half of searching for the right property. We hope to retire here one day. In the meantime, maintaining and improving the property is our labor of love. toilet, combination tub/shower, In hallway near upper floor bedrooms. toilet, combination tub/shower, On lower floor. 3 full bathrooms, with bathtubs and showers. This property is very close to the action, but far enough away to make your stay very pleasurable. Main telephone is on the desk in the upstairs mudroom/laundry area, and a cordless remote handset is located in the downstairs bonus room. Natural gas central heating, with upstairs and downstairs independent controls. Wood-burning fireplace with gas log lighter in the living room on the upper floor. 2-Car garage, room in front of the house for off-street parking of 3 or more vehicles. Additional parking is available at the Zephyr Cover Resort. Attached 2-car garage with street-level entry. High-Speed Internet available via wireless signal throughout the house and decks, with a desk and HP network printer in the upstairs mudroom/laundry area. Couches, easy chair, wood-burning fireplace, and large-screen TV w/Cable. Frigidaire w/icemaker installed in January, 2013. Extra refrigerator in the garage for more capacity. Rice cooker, crock pot, wok, large coffee urn. Kitchen is fully-equipped with dishes and utensils for 14 or more people. Fully-equipped kitchen, including oven/range, refrigerator, microwave, coffee maker. Dining Room seating for 14, including two stools at kitchen table. Televisions in Living Room (48-in smart TV), Family Room (40-in smart TV), and Master Bedroom (28-in), all equipped with Charter Cable. TV's w/Cable in Living Room, Master Bedroom, and Downstairs Bonus Room. Living Room and Bonus Room TV's have DVD players. Junior-size pool table in the downstairs Bonus Room. Deck on each level. Upper deck is 500 square feet, with hot tub, patio furniture, and gas grill. 8-ft x 8-ft Hot Tub on upstairs deck, with two speed pump and good air action. Family room with comfortable furniture and junior-size pool table. 'Business Center' upstairs has desk, lamp, Ethernet HP OfficeJet 4500 printer/fax/scanner/copier, and some stationery supplies. House has natural gas central heating. Located at Zephyr Cove, and just a 2-5 minute walk to the Zephyr Cove Resort Beach. Nearby Sunbathing, Lake Cruises, and Gaming. The Zephyr Cove Resort restaurant, general store & gift shop are open year-round. In the summer, the beachfront bar, swimsuit shop, watercraft rental, and parasailing attraction are open. The resort includes a MILE OF SANDY BEACH. A rustic public park is 1/2 mile from the house, with lit tennis courts, softball field, playground, picnic areas, and fitness courses.